GALLIPOLIS — The Gallia County Junior Fair Board members sought to inform meeting attendees Tuesday night as to the necessity and legal aspects of a one-quarter of one percent tax levy to help fund fairground relocation efforts. 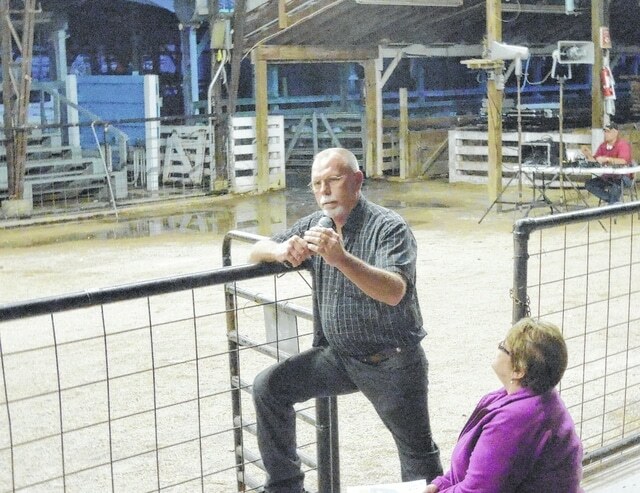 The public informational meeting — the third of its kind in recent months — was conducted at the Gallia County Junior Fair show arena on Jackson Pike. According to fair volunteer Jodi Penrod, the entirety of the cost for the fair relocation and new building construction is estimated at roughly $9.5 million. This includes infrastructure such as roads and power line construction, actual building construction, new show arenas and other necessities such as seating. The sales and usage tax, should it pass, would mean that for every $4 spent, one cent would go toward the fairgrounds relocation, or for every $100, 25 cents would go toward the relocation. The one-quarter of one percent sales tax would only apply to goods and services. No other taxes would be levied on food items or property. This tax would also apply to visitors passing through the county and making purchases. The one-quarter of one percent sales tax increase is estimated to generate about $900,000 for the fair relocation project. If the debt structure for the new fairgrounds project is set to be paid over a 20-year term, with estimated payments being made at about $700,000 a year (at a four percent fixed loan interest rate), the other $200,000 could be put toward the principal of the loan. This would potentially mean the loan could be paid off much sooner. As soon as the debt is repaid, the tax would cease to exist. To view the FAQ, click here. The proposed land for the new fairgrounds is already under the ownership of the fair board and sits next to the Gallia County Junior Fairgrounds outside of the floodplain in which the current grounds are located. It can be reached by taking the side road next to the Shake Shoppe on Jackson Pike. The fair board is looking at creating a new livestock pavilion and barns, a building for commercial and 4-H activity, a horse barn, a staging area, pulling tack, derby pit and carnival area. Fair board members said the aim is to make the fairgrounds a multi-use, year-round facility for 4-H, Boy Scouts, Girl Scouts, FFA and the French 500 Flea Market. They also hope a year-round facility would attract other events and be useful to the community, as well as attract personal events. Some of the suggested options included hunting shows, church activities, weddings, sports shows and larger agricultural events. The old grounds could potentially be used for new community sporting fields or commercial property. The fair board is open to the leasing or sale of the old grounds. One of the main concerns of board members with moving the fairgrounds is to help prevent damage and dangers caused by flood waters to grounds users. Gallia County Junior Fair board secretary Tim Massie emphasized the importance that the public understand that any money collected from the sales tax goes directly to funding the fair relocation project. It does not go to funding any other causes or persons beyond the project. Fair board members urged the public to contact them with any questions or concerns about the fair relocation project. They can be contacted at (740) 441-7938 or at gcjf1950@gmail.com. Gallia County Junior Fair board treasurer Mike McCalla addresses attendees at a public fair relocation informational meeting Tuesday as water sneaks into the Gallia County Junior Fair show ring due to rains over the course of the evening.